provided information to help readers understand a little more about wines available in this country, briefly covering the whole wine industry, including the Producing Wholesalers, Private Estates, Co-operatives and their wines without the reader becoming bogged down with detail. ?He has also covered the country or region of origin of readily available imported wines which are stocked in liquor outlets in South Africa, giving their background and the grapes in the making of the wines. All this writing is put over in a way that is very informative ad yet easy to read. Talented and extremely competent, Bolsmanne is fully involved in management training for the hotel industry. As you will find when you use this dictionary, the author has the gift of being able to give facts clearly and concisely, which is important to the wine lover and wine student alike. 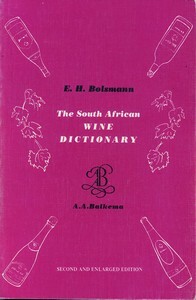 The South African Wine Dictionary was first published by A. A. Balkema in Cape Town in 1977. The new, enlarged and updated edition shown above was published in 1984. The book is now a rare collectors item.